Welcome to Le Vashoff Hotel! We are glad to welcome you in the Northern Capital of Russia! We will spare no effort to surround you with attentive care, home-like coziness and comfort. Our hotel offers a wide range of services for the guests who want to relax and have fun or hold business meetings. Our friendly staff will inform you about tourist attractions of the city. 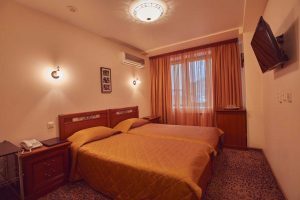 Our hotel is within easy walking distance of a supermarket and ATMs and a 5-minute walk of the Petrocongress conference center, the LDM theater and the famous Krestovsky Island with the biggest local theme park, dolphinarium, Volleyball Academy, SIBUR Arena Sports Complex and Gazprom Arena Stadium. Petrovsky Stadium, SKA Sports Palace and the Peter and Paul Fortress — one of the most important tourist destinations of St. Petersburg — are also within walking distance. 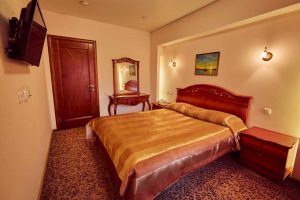 The hotel stays in the immediate vicinity of Bolshoy Prospect with its luxury shops and boutiques which makes it the ideal place for shopaholics. Le Vashoff Hotel in the Petrogradskaya Storona is a pleasing place to stay for any guest of the city. It is the oldest district and a genuine historical center of St. Petersburg, a cluster of seven islands by the side of the Neva River in close proximity to business centers and major thoroughfares. Also it is within walking distance from historical and cultural monuments of the Northern Capital, 40-minute ride from the Pulkovo airport and 25-minute ride from the Moskovsky railway station. Chkalovskaya and Petrogradskaya metro stations are within 10-12 minutes on foot. Hotel amenities include cafeteria, gym, sauna, conference room and pool hall. Our rooms are fitted with mini-bars, satellite TVs, shower cabins, air conditioning and safe-boxes. Wi-Fi is available in all hotel areas. We offer free parking and breakfast, as well as car wash services at reduced price for car owners. We are glad to welcome you in the Northern Capital of Russia! We will spare no effort to surround you with attentive care, home-like coziness and comfort.